Competition in the luxury wagon market is tough and buyers expect a great deal for their money. To this end, the Volvo V90 lives up to high expectations. 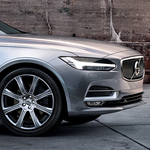 Two features stand out for the Volvo owner. The first is the ability to change the suspension performance based on driving conditions. The operator may choose the Comfort mode with a softer feel. But when negotiating country roads, the suspension can be changed to Dynamic mode. This provides a stiffer suspension for making tight turns and moving in and out of traffic. Volvo’s Pilot Assist feature offers you more confident driving. When following another vehicle on the highway, the Pilot Assist front camera and radar tracks the speed and distance of the other vehicle. It then adjusts speed to keep a safe distance. In addition, Pilot Assist automatically adjusts steering to keep the V90 in lane. Our team at State College Motors can go through the full set of features the V90 has to offer.